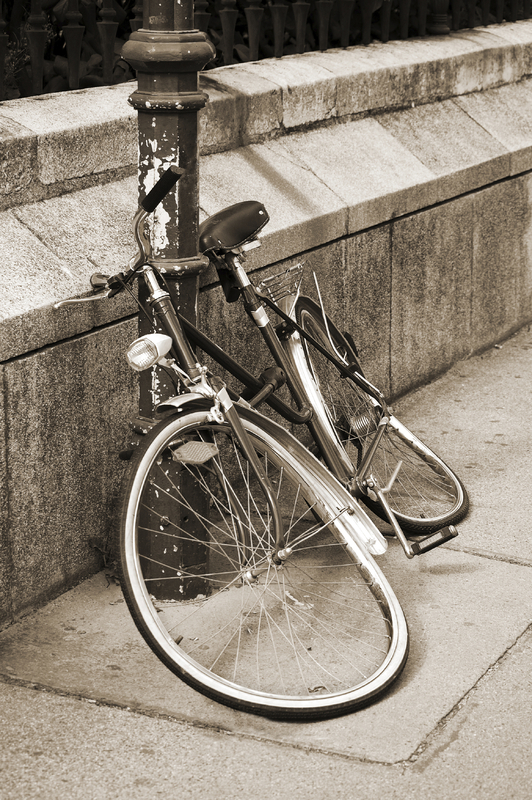 I came very close to cutting off an oncoming cyclist the other day while I was making a left turn. It was one of those “close calls” that had been regular features of my driving experience until the Spring, 2012, when I started using a tool to help me focus on the critically important task at hand. It is a simple tool: making the conscious effort of keeping my hands at a certain position on the steering wheel. When my mind wanders, so do my hands. The movement of my hands to more comfortable positions alerts me to refocus my attention. I stopped having those “close calls” that cause shivers down your spine with the realization that you have just about caused a crash. My personal success lead me, in the Spring, 2013, to issue a challenge for all drivers to use the same tool. I called it “doing the 10 and 2” for the hand position I had been taught as a young driver. I have since learned that “9 and 3” or “8 and 4” might be more optimal hand positions, but the particular positioning you choose is irrelevant to the usefulness of the tool. What happened the other day when I had another one of those “close calls”? I was having an animated discussion with my associate on the way to a mediation for an ICBC claim. My mind was focussed on the factual and legal issues of the case. My driving turned into that dangerous, inattentive “autopilot” that causes crashes. Had I not been cautioned by my associate, I would have pulled directly in front of the cyclist who was clearly and plainly there to be seen. 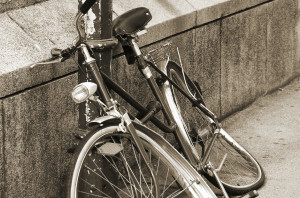 I wasn’t speeding, texting, talking on a cell phone, eating a sandwich, fiddling with the stereo or GPS, and I certainly wasn’t under the influence of alcohol. There were no “don’ts” about my driving behaviour, but at that moment I was demonstrating the same driving inattention that causes one crash every two seconds in British Columbia. I have now learned that I am not capable of maintaining driving focus while engaging in a complex discussion with my passenger, so that behaviour has been added to my own personal list of “don’ts”. I think we get distracted by the “don’ts”, though. There is one, very critical, “do” that if implemented would slash those crash statistics. How do we change our driving culture (I am including myself within that culture) to simply put our attention to the road as our forefront, rather than our background, focus of attention? One way is by opening our eyes to the immense personal losses, in injuries and deaths, caused to British Columbians as crashes continue to occur at that insane rate of one every couple seconds. 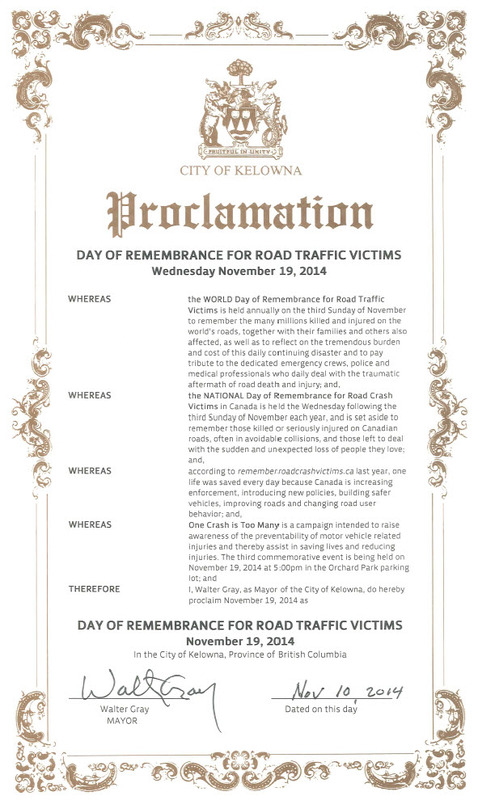 Please join me and others at Kelowna’s 3rd annual commemoration of the National Day of Remembrance for Road Traffic Victims this coming Wednesday, November 19, 2014, in the Orchard Park Mall parking lot, corner of Dilworth Drive and Highway 97, at 5:00 p.m.
Mayor’s Proclamation of the National Day of Remembrance for Road Traffic Victims – Take a look!